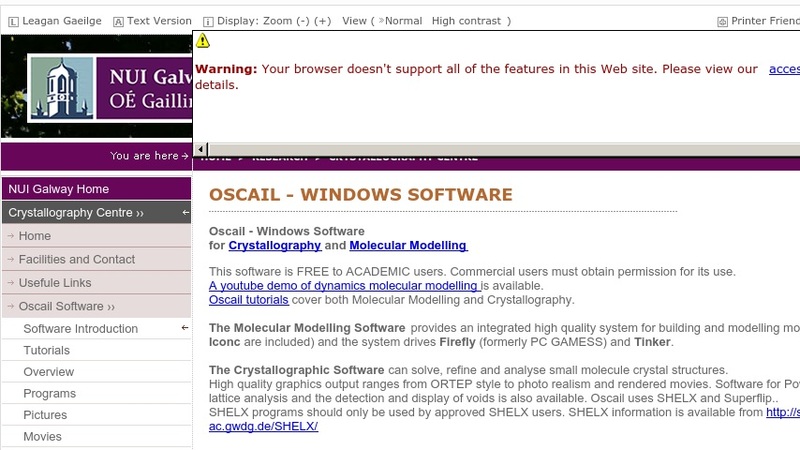 Oscail X is Windows Software for Crystallography and Molecular Modelling. This software is FREE to ACADEMIC users. Commercial users must obtain permission for its use. Oscail tutorials covering Molecular Modelling and Crystallography are available. This Windows software provides an integrated high quality system for building and modelling molecules (Mopac and Iconc are included) and the system drives PC GAMESS and Tinker. The crystallographic software can solve, refine and examine small molecule crystal structures. The pictures produced range from high quality HPGL to photo realistic rendered 3D. Rendered movies are effective and easy to make using RASMOV. Software for Powder pattern simulation and the detection and display of voids is also available.